Will they prosecute Saddam’s Partners? 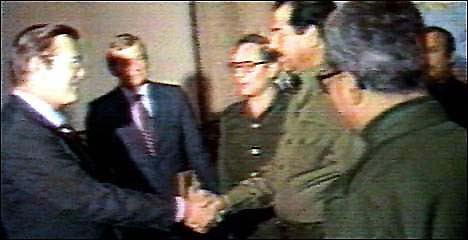 This is a real picture of our current Secretary of Defense, Donnald (Rummy) Rumsfeld shaking hands with Saddam Hussein. The picture was taken during the Reagan Administration after Saddam supposedly gassed the Kurds. Back then we didn’t care about that because Saddam was on “our side” and – after all – we gave him the gas. So – isn’t it a little late for us to get moralistic about that issue when Rummy has his hands dirty? Saddam is a bad guy and he deserves to die. But the real threat to the world right now is Bin Laden, Ariel Sharon, and George W. Bush. If one deserves the death penalty, they all deserve it. Next Post: Are you better off than you were four years ago?